With the EJE M15 Jungheinrich offers an economic alternative to the electric pallet truck. 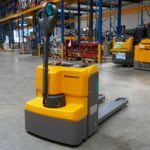 The newcomer fills the gap between the hand pallet truck and industrial EJE series and has a lifting capacity of 1,500 kg. We tested the EJE M15 to see how it performs compared to similar trucks in this segment and what the differences are between the M15 and his powerful brother the EJE 116. Of course, a comparison between the Jungheinrich EJE M15 and the EJE 116 is not that obvious. The EJE 116 has an impressive track record and has been developed for harsh and industrial environments. 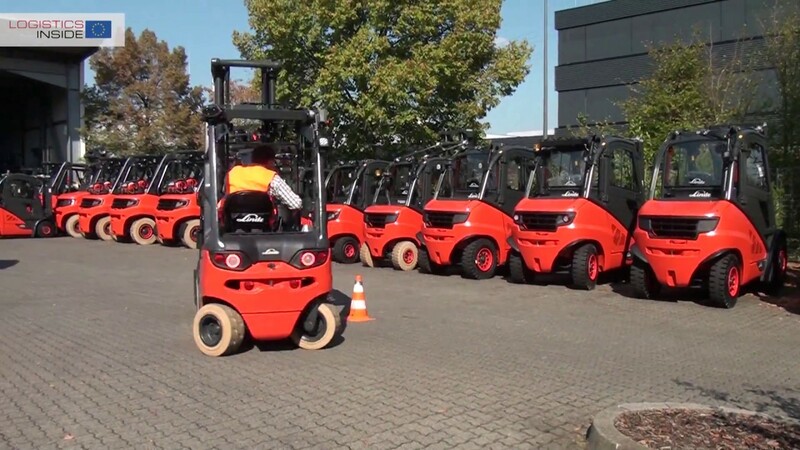 With a robust chassis, a steel battery compartment with 24V/150-250 Ah lead-acid battery (Li-ion battery optional available) and a proven tiller concept this workhorse sets the tone in the pallet truck segment. The M15 is noticeably lighter in construction and even more compact, equipped with two maintenance-free 12V gel batteries and a simpler tiller version. The M15 is intended to fill the gap between the hand pallet truck and the EJE 116. 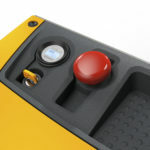 It mainly offers an ergonomic solution for manually moving palletised loads. 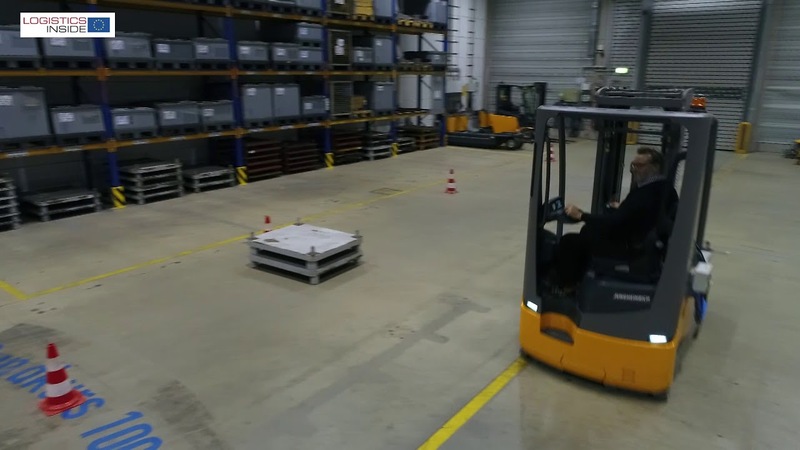 In previous tests we already concluded that the hand pallet truck is no healthy alternative for loads of 700 kg and above. There are more and more trucks on the market such as the M15, ideal for the occasional to regular usage of loads up to 1,500 kg. 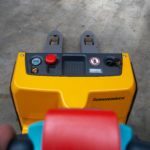 In addition to that, they are more favourably priced than traditional electric pallet trucks. 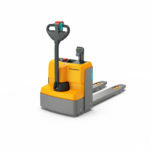 The Jungheinrich EJE M15 applies to the benefits mentioned above for 100%. The truck weighs no more than 219 kg, which is less than half of the EJE 116 and is about 25% cheaper. But do you also get 25 to 50% less truck and performance? The answer is a simple ‘No’. The M15 is doing its job without hesitation and offers even some advantages compared to its big brother. It is more compact with its 60 mm shorter L2 size. Useful if you need a truck for small areas or in lorries. It is easier to see the fork tips and the M15 is equipped with maintenance-free gel batteries. Both truck models are equipped with brushless AC-technique. 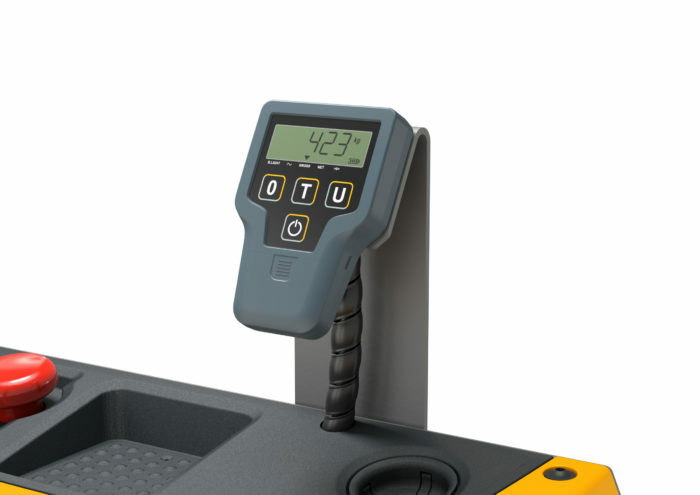 The maximal running time on a completely charged battery is one important difference with the EJE 116. 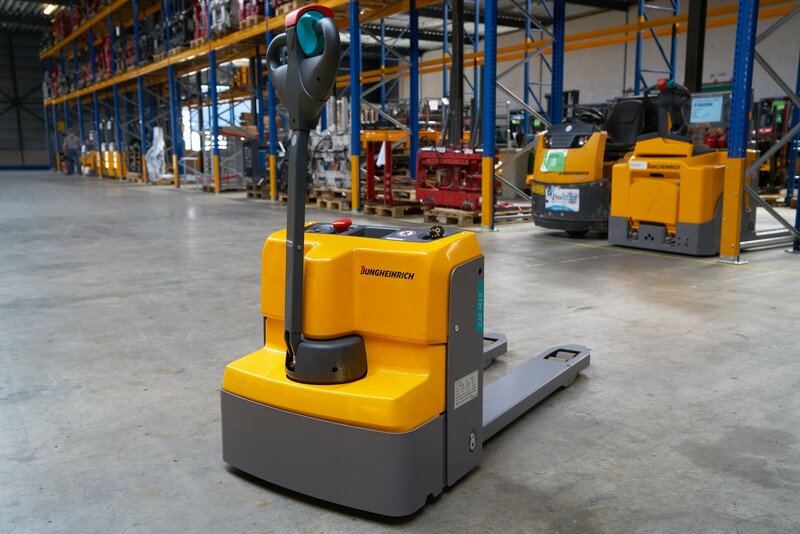 The EJE 116 has a double size battery and can also handle a double amount of pallets before the battery must be charged with the built-in charger. Does this means the M15 offers poor results? Again, the answer is ‘No’. With a theoretical number of 445 pallets the newcomer performs excellent considering what is it build for. To make life easy, this smaller truck is equipped with a built-in 230V charger as well. Any normal electrical outlet will do, and charging on the go in the truck or lorrie is not a problem. You will find the main differences between the M15 and the EJE 116 in the overall character of the bigger brother. The EJE 116 is more quit, smoother and slightly stronger. 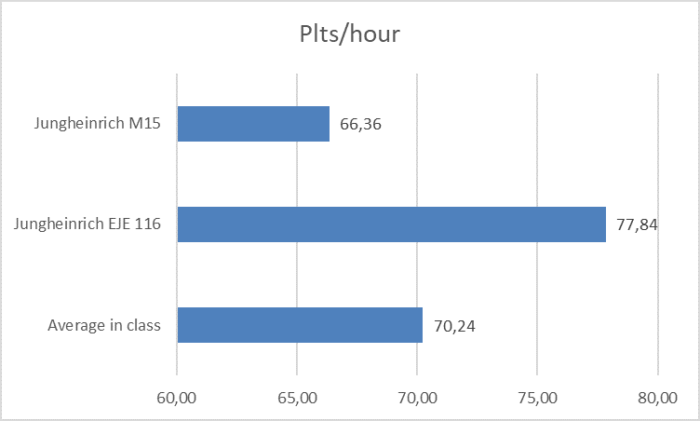 The acceleration and traveling speeds are just slightly higher. That’s why we move more pallets per hour. The EJE 116 is clearly intended for a more intensive use and is little less economical in our consumption measurement. The kWh-performance of the M15 is lower, but it takes longer to complete the track. Converted to the energy level needed per 100 pallets, both trucks show the exact same value. Of course, we compare the scores of the EJE M15 also with previously tested and similar light electric trucks. 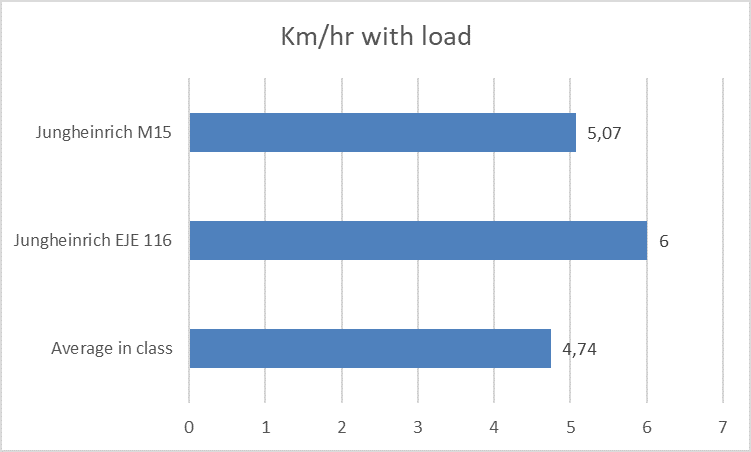 Here we see that the Jungheinrich truck uses a little more energy and is a little less productive. These differences are entirely attributable to the 200 kg higher lifting capacity of the truck and the heavier loads we handle during the test. To move more weight you simply need more time and energy. 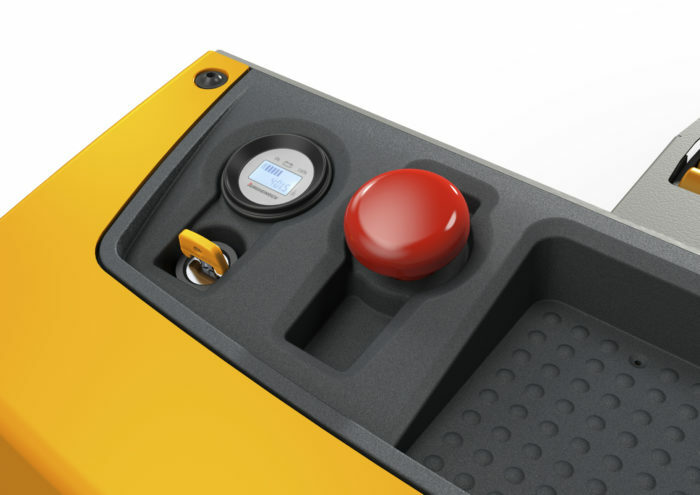 When it comes to operating the Jungheinrich EJE M15 the conclusion is clear: easy! After turning the ignition key, the truck is almost immediately ready for action. 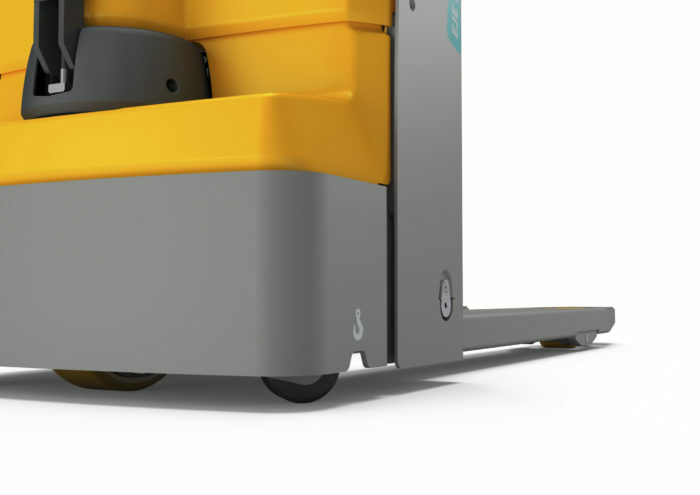 The drive unit is centrally positioned and thanks to the two support wheels the truck itself is stable enough. The tiller is slimmer and lighter constructed compared to the EJE 116, but it will do its job fine. The M15 lifts faster than its bigger brother, but this advantage gets lost during the lowering of the fork which takes longer. 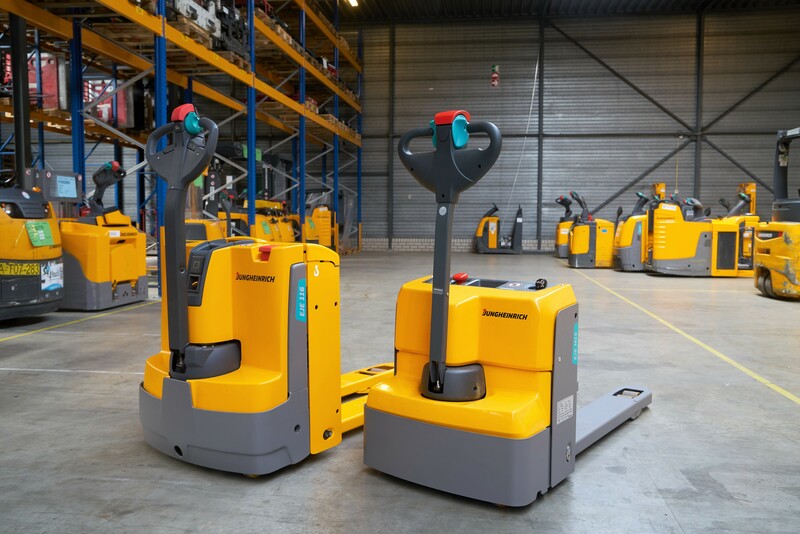 Thanks to the tandem fork wheels the M15 runs smoothly over bumps and the side entries of a pallet. Here the roll up wheels in the fork tips lend a helping hand. 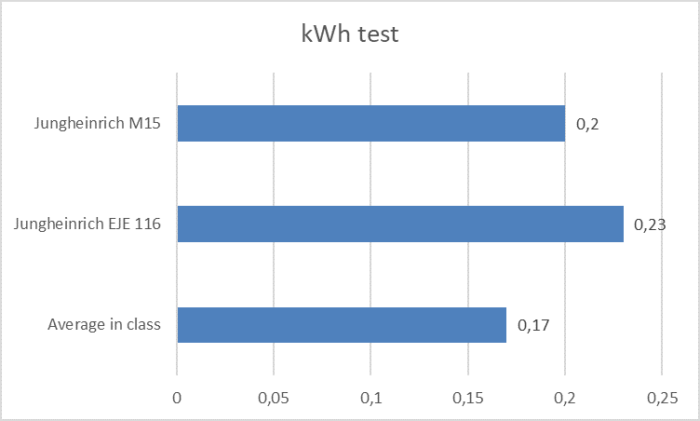 Our test truck is equipped with a simple but efficient hour meter with battery-discharge indication. On the hood we also find the emergency stop and a small storage box. The plug for the built-in charger is easy to use. The spiral cord is long enough to reach a 230V outlet. 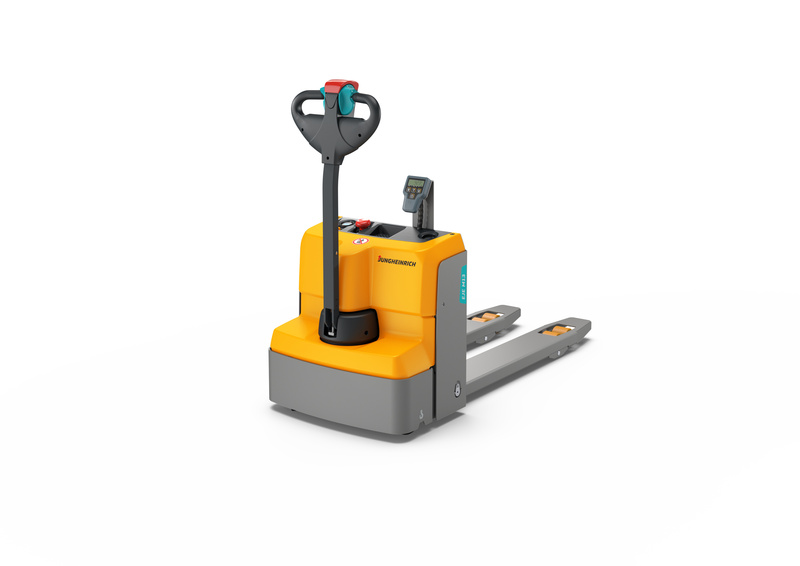 In general, the Jungheinrich EJE M15 works fine with loads up to 1,500 kg. The truck is stable, easy going, offers value-for-money and performs conform market average. 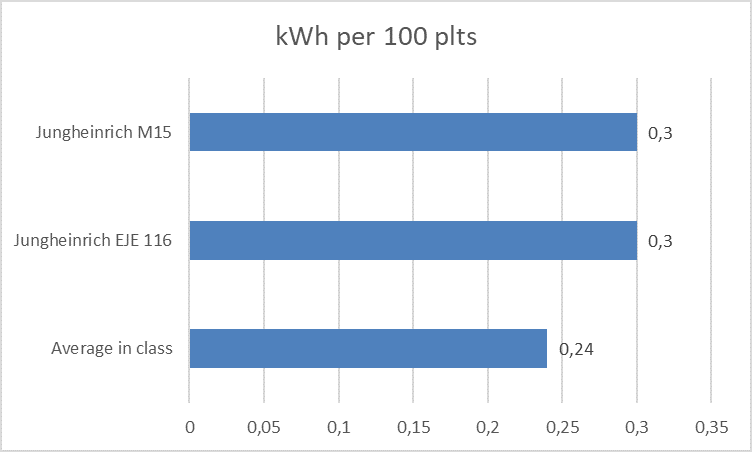 Points to improve are, in our opinion, a slightly more quiet course of the AC electric motor and a faster lowering of the fork. 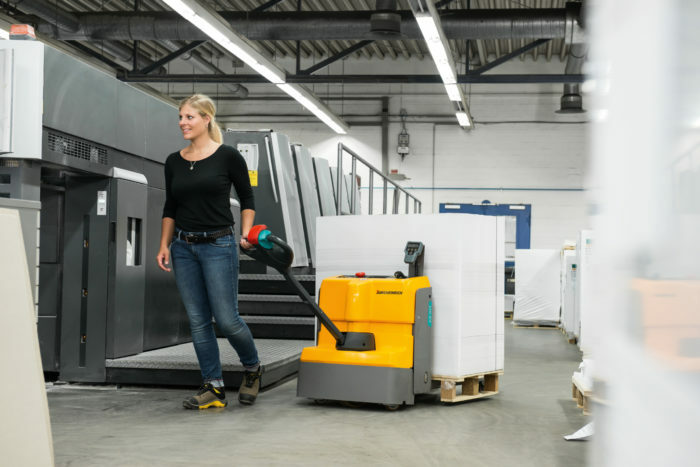 Concerning the usage, it is clear that the M15 is a hassle-free, powerful and healthy alternative to the hand pallet truck and a more economical alternative to the industrial EPT. The truck is the most at its place in the light to moderate intensive environment. If the job includes a more industrial and more intensive use, the EJE 116 offers a better perspective. 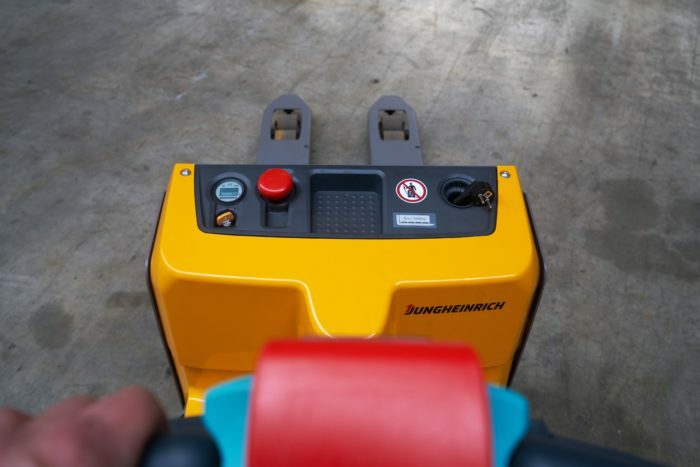 In this way Jungheinrich offers an appropriate choice for each pallet truck demand. The EJE M15 is equipped with AC-technique and a steel chassis. The top cover is plastic. Thanks to the low construction height and short L2 size is the truck is compact and offers excellent view on the fork tips. 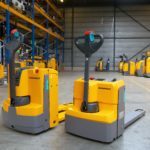 The compact Jungheinrich EJE M15 (right) weighs half of the EJE 116, is more compact, but also able to move loads up to 1,500 kg. Charging the maintenance-free gel battery is easy via the built-in charger and a 230V wall socket. 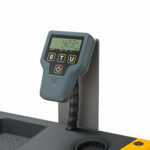 Optional is the built-in and easy to operate weighing unit with display. 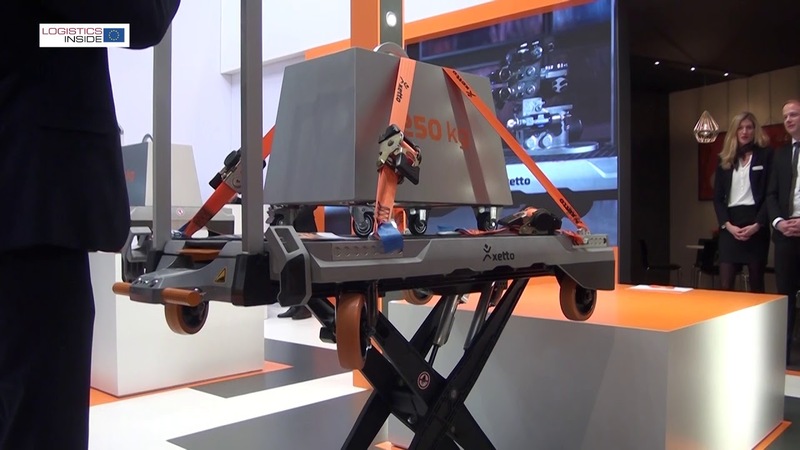 From an ergonomic point of view hand pallet trucks are not recommended for loads above the 700 kg. The M15 is a responsible alternative.